Danone Group Indonesia - Danone Indonesia is a well-knwon foreign investment company in Indonesia that is involved in a major market segments namely food, beverages and nutrition industry. Danone Indonesia running business in 3 business pillars; water, early life nutrition, and medical nutrition. Based in Jakarta, Danone Indonesia runs its business through 5 business units/subsidiaries, namely PT Danone Dairy Indonesia, PT Tirta Investama (Danone Aqua), PT Sarihusada Generasi Mahardika (SGM), PT Nutricia Indonesia Sejahtera and PT Nutricia Medical Nutrition. Currently, Danone Indonesia runs its business through 23 production plants and directly employs nearly 15,000 employees throughout Indonesia. Danone Indonesia is a local member of France multinational giant, Groupe Danone SA (Danone Group). Danone Group is recognized as one of the largest food and beverages companies in the world. In Indonesia, Danone Group has been active since 1998 by signing a strategic alliance with Aqua, the most popular brand for bottled water products in Indonesia which was launched in 1973. According to Danone Group Annual Report 2016 as cited by JobsCDC.com, Danone Group registered total sales of €21,944 million in 2016. Danone Group owns several internationally known brands and present in over 130 markets spread on 5 continents worldwide. Danone Group has 190 production plants and approximately 100,000 employees spread in all the world. Background in Bachelor degree of Economic, Informatics Engineering, Industrial Engineering, or Civil Engineering. Still registered as an active student are welcome to apply. Preferably coming from reputable university in Indonesia. Strong analytical thinking, operational, and detailed oriented. Having proactive and assertive behavior. Willing to be placed in Danone’s office in Kuningan, Jakarta Selatan. For those who have graduated, if selected must start the internship within one year of graduation. Knowledge of – or proven interest in the area of management, business or marketing. Actively involved in student organization. Able to analyze and coordinate project related with stakeholders. JobsCDC.com now available on android device. Download now on Google Play here. Please be aware of recruitment fraud. The entire stage of this selection process is free of charge. 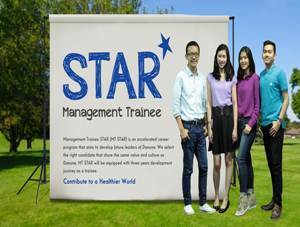 Danone Indonesia - Fresh Graduate Intern Program Danone March 2018 will never ask for fees or upfront payments for any purposes during the recruitment process such as transportation and accommodation.